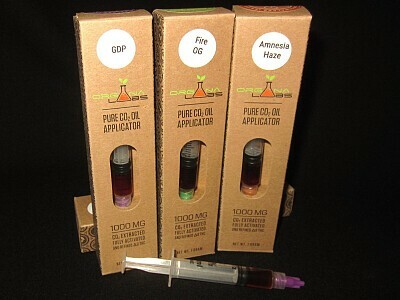 We here at Lifted Health and Wellness are proud to carry Organa Labs Pure C02 Oil Applicators. Instead of us trying to explain what makes Organa Labs C02 oil great, we figure we will defer to the experts themselves. "Organa Labs currently employs a supercritical, carbon dioxide(c02) extraction process to unlock desirable cannabinoids, terpenes and other key components of cannabis. This extraction process helps separate these components to enhance overall experience. A supercritical fluid, no matter how much pressure is applied, will not compress into a liquid. It exhibits properties of both gas and a liquid, often with densities approaching diffusivity (the ability to move into and through small spaces) and that of a gas. This makes supercritcal fluids ideal for extractions." If sifting through all that jargon just doesn't appeal to you, it can be summarized by saying that their process allows for some of the tastiest oil around. Its the same oil used in Open Vape cartridges so you know what you're getting is great. This oil will be ideal for a variety of applications including smoking(add some onto your flower for a strong experience), vaping, dabbing, or even to make edibles. The world is your oyster. All applicators are 1000mg total for $38 each. Granddaddy Purple(I) - A legendary indica that is a California staple.